My father, Denys Ilett, was born in Worksop, Nottinghamshire, in 1914. He was the seventh of nine children, two of whom died in childhood. His parents were Edwin, a tailor, and Annie, always known as Nancy, who shared a love of music and acting. Edwin struggled to provide for his family during the Great War. Five days after his younger daughter Althea was born prematurely in 1918, he was found dead in bed from influenza. Life was very hard, but Nancy’s solace was music and she nurtured a love of music in her children, almost all of whom sang, played an instrument, or both. Nancy was always ready to drop everything to go to sing at the Methodist chapel. Unfortunately, when Denys was 11, enthusiasm overcame caution and she was knocked down by an “omnibus” on the way to choir practice. She sustained a broken leg and spent many weeks in hospital. Denys was fetched by his aunt Allie (Althea), from Goosnargh, Lancashire. Allie and her husband were the local school teachers. They must have spotted Denys musicianship, for they bought him his first violin. School was not a rewarding experience for Denys. The family’s poverty meant there was no prospect of grammar school or university. He left school at 15 and was apprenticed as a carpenter, later becoming the director of a building company. 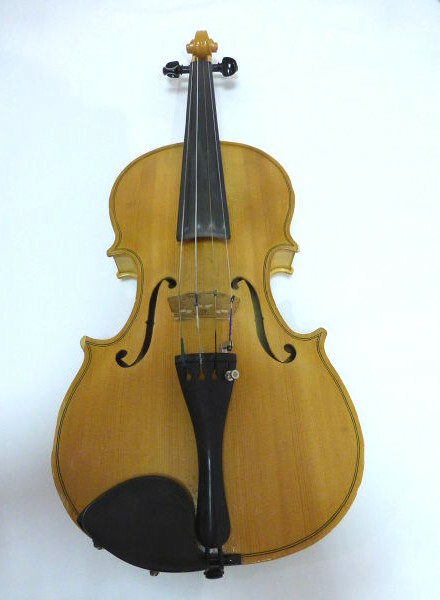 Retirement allowed Denys to take up a new interest – violin making. He completed two beautifully made instruments, studying with makers in Sheffield and Newark. This is the first.